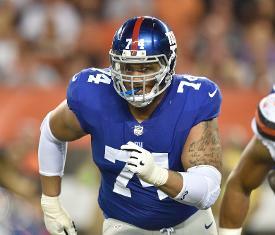 After an offseason of trade rumors, an agent change and a minicamp no-show, New York Giants offensive lineman Ereck Flowers has reportedly returned to the club. According to multiple reports, Flowers arrived at the team's facility Monday, his first appearance during the offseason program of new Giants coach Pat Shurmur. ESPN's Adam Schefter was the first to report the news. Flowers, 24, is expected to move to right tackle after the team signed free-agent left tackle Nate Solder to a record-setting deal in the offseason. Flowers made news when he did not report to a minicamp last month. On May 1, Flowers shared a post of his agreement to join agent Drew Rosenhaus and Rosenhaus Sports. Flowers had been using his father as his agent and manager. A day later, the Giants declined to pick up Flowers' fifth-year option, making him eligible for free agency after this season. The ninth overall pick in 2015, Flowers has started all but two games at left tackle through three NFL seasons, but he has struggled, giving up 17.5 sacks and taking 23 penalties in that span. He has not played right tackle since 2012, when he was a true freshman at the University of Miami. "We've been in contact with Ereck. It's our understanding that he's in good shape," Shurmur said Saturday. "I can't wait for him to be here. I've mentioned it in the past, there were some things that he did last year that were really good, and I look forward to him getting here at some point and working with him."